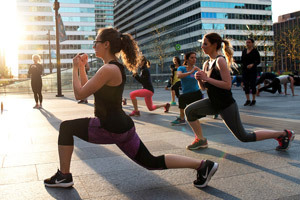 Fitness Classes in Dilworth Park! 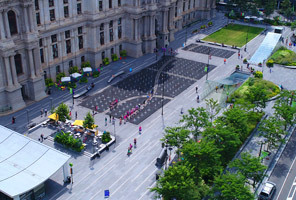 Get a free workout with Spring Training in Dilworth Park at City Hall! On Tuesdays, Wednesdays and Thursdays, April 3-May 24, join in on a variety of sports and fitness programs, conducted by experts in the field of personal fitness. Yoga, Zumba, fitness boot camp, running- it's all here to get you informed and in shape for spring and summer. Plus, Zumba® Fest – Dance for Peace will be held in the park on May 19! All season long, you can also fuel up with healthy offerings from the Dilworth Park Café. Spring Training is presented by Rothman Institute with partners Optimal Sport Health Clubs and City Fit Girls. Bring your opinions and questions to the Pennsylvania Academy of the Fine Arts on March 24 at 2pm, for a lively conversation about one of the most important issues facing museums in the 21st century – the relationship between institutions, artists, audiences and the politics of our day. Hear from experts in the field as they unpack the complicated, and sometimes contentious, arguments around this topic. Presenters include Nato Thompson, Artistic Director, Philadelphia Contemporary; Shantrelle P. Lewis, Curator and Critic; and Clarity Haynes, Artist and PAFA Alumnus; moderated by Susan Lubowsky Talbott, Executive Director, Fabric Workshop Museum. Get Around Center City in a PHLASH Once Again! The Philadelphia PHLASH buses start their routes with Friday-Sunday service on March 29! Daily service begins May 1 and runs through September 3. Hop on and off with service every 15 minutes at 22 locations throughout Philadelphia. Pay only $5 for an all-day pass or $2 per ride to begin exploring Philadelphia’s most popular cultural institutions and attractions. Children 4 and under and seniors are always free. SEPTA pass and Key card holders ride free. For more details and a route map, visit PhillyPHLASH.com. Spring is Springing in CCD Parks! Spring is in the air in Center City! On April 1, the grand fountains at Dilworth Park (1 South 15th Street) return, with the Air Grille, a shiny Airstream food truck operated by Brûlée Catering, reopening next to the Dilworth Park Café on April 2. Over at Sister Cities Park (18th Street and the Parkway), the fountains switch on April 1, with the Boat Pond opening later in the month. In lovely, tucked-away John F. Collins Park (1707 Chestnut Street), the fountains also come to life on April 1. For more information on all of our parks, visit CCDParks.org.